The Government described the first defeat to be inflicted on the Bill during its passage through Parliament as “disappointing”. Ministers will seek to overturn the defeat in the House of Lords on the Government’s Brexit Bill when the legislation returns to the Commons, Government sources said. Peers defied Theresa May, voting by 358 to 256 in favour of an opposition amendment guaranteeing the rights of EU nationals living in the UK after Brexit. The Government described the first defeat to be inflicted on the Bill during its passage through Parliament as “disappointing” but made clear they were determined to reverse it in the lower chamber. A spokesman for the Brexit Department said: “The Bill has a straightforward purpose – to enact the referendum result and allow the Government to get on with the negotiations. Opposition parties, who backed the amendment, urged ministers to take the opportunity to rethink their position on EU nationals, amid concern among many Conservative MPs and peers. 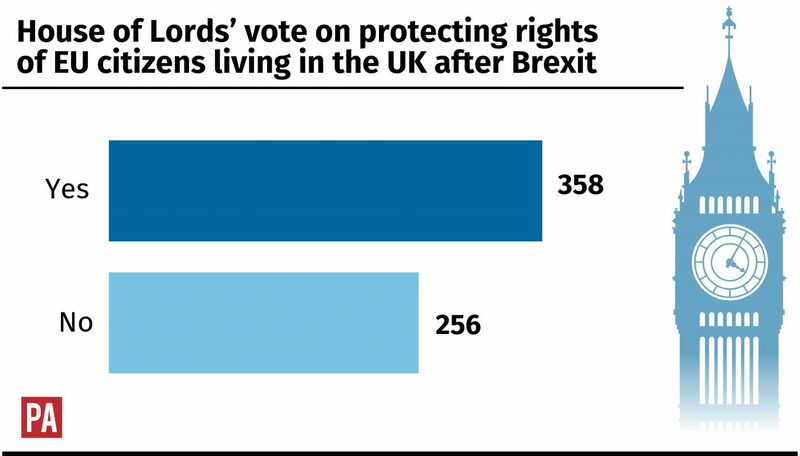 The Government has always argued that while it wants to secure the future rights of EU citizens, it needs to be able to secure reciprocal rights for British citizens living in the EU at the same time. For Labour, shadow Brexit secretary Sir Keir Starmer hailed the vote as a “welcome and important step forward”. There is a growing consensus that this must be resolved before Article 50 is triggered, and the Prime Minister is now increasingly isolated. Tim Farron, the leader of the Liberal Democrats who also backed the amendment, said: “The Prime Minister must now listen and accept this amendment. “I can guarantee that Liberal Democrats will keep trooping through the lobbies time after time, if needed, to defend EU citizens’ rights. Well done to colleagues in the House of Lords for sending a clear message: EU citizens in the UK are our friends, not bargaining chips. There was however anger among some pro-Brexit MPs at the attempt by peers to frustrate the will of the elected House of Commons which passed the Bill – authorising the Government to trigger Article 50 starting the formal Brexit process – unamended. Labour MP Gisela Stuart, who co-chaired the official Vote Leave campaign, said : “The British people voted in their millions to leave the EU, and their elected MPs passed the Article 50 Bill without amendment. Conservative Theresa Villiers, the former Northern Ireland secretary who campaigned for Brexit, said there was wide sympathy for the position of EU nationals but the Bill was “not the right vehicle” to resolve it. “The blockage here is the European leaders and their refusal to embark on any kind of negotiations prior to the invocation of Article 50,” she told Channel 4 News. Next article Are sleep tracker apps actually harming your sleep?